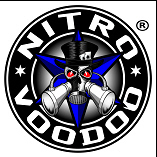 Chris Matheson and his “Nitro Voodoo” Top Fuel Motorcycle dominated the Gulf Western Oil 51st Winternationals with a clean sweep in the Gasoline Alley Harley-Davidson Top Bike category at Willowbank Raceway. Matheson officially wrapped up his 5th Top Bike Drag Racing Championship on his first pass on Saturday morning and went on to set Low ET, Top Speed and a Top Bike win. The program originally was for the “Nitro Voodoo” bike to make its first qualifying pass on Friday afternoon, however, a heavy shower ended the day early. Matheson said, “We lined up to run our first qualifier, but the skies opened up and we copped a hammering from the rain as we headed back to our pit area. We virtually had to strip the bike that night to ensure it was dry and ready to go for the next day. Saturday’s first pass saw the “Nitro Voodoo” set the pace with a 6.34 ET at 215.25 mph (346.411 kph). A second run saw “Nitro Voodoo” in the right lane, however just past the starting Christmas Tree, the bike lost traction and went up in smoke. Matheson recovered after three pedals and finished the run in 6.83 seconds at 195 mph [315.32 kph]. The OVO Livestream vision saw Matheson carry the front wheel in the second half of the track before having a wild moment in the breaking area and eyes like dinner plates. Crew chief Graeme Turner said that it was time to give the bike some more clutch, however, it may have been a tad too much! With four Top Bikes entered it was decided to run the “All Run” format for Sunday giving the fans the opportunity to see all riders make three runs throughout the day. 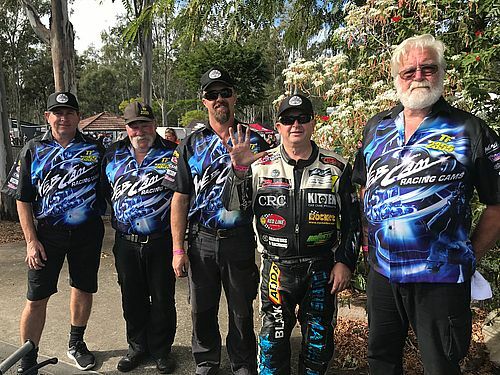 It had been a hectic few weeks for Matheson and his crew, however he was down to the final day and wanted to finish off the Winternationals on a high! “The pressure was on and I wanted to record a good ET and win all the rounds today,” said Matheson. 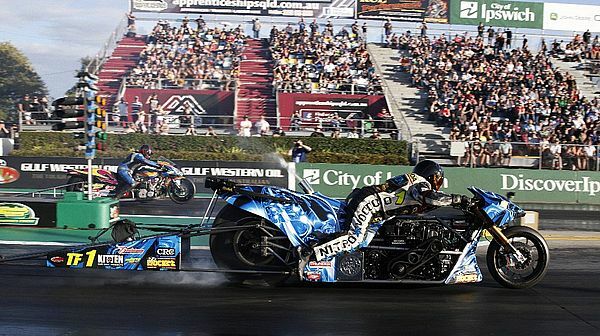 “Our first run I had to pedal the throttle a couple of times but still took the win with a 7.02/178 against a 7.61 from the Ballistic sponsored nitrous bike of Robert Cassar. Things got wild in the braking area for the “Nitro Voodoo” bike with Matheson hard on the brakes. At one stage it looked as if had locked up the front brakes. It was certainly one of the rides of his life. “It was a very quick pass, but without a time slip we will now never know,” said a dumbfounded Matheson. It was very disappointing to say the least as the bike really took off down the track. I had to work hard in the braking area to stay upright and stopped just short of the sand pit. “By the time the finals were run the track had cooled off. The sun had disappeared and we were running under lights. It was fantastic to still see the massive crowd in the stands waiting to see us run. “I was taking on Gavin Spann and thinking how great it was to see two multi-cylinder blown Top Fuel motorcycles in the final. Gavin and his crew had put in a huge effort to get to the final after damaging his rear-end yesterday, and from experience, I know he can run the numbers to beat me. 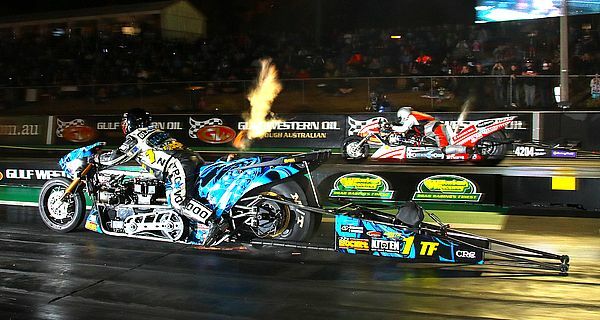 “We both left on green and it was game on, however I crossed the finish stripe first with a blistering 6.08 ET at 215 mph and picked up a gold 400 Thunder Christmas Tree trophy for the win. “I’m really proud of my team who have stepped up all year and delivered me a championship winning fast bike. Five championships are huge, not only in Australia but also in the world. It was a true testimony of the team’s ability to perform and stay focused. “Wrapping it up this weekend at my home track is the icing on the cake. But as you know we have bigger plans and are continuing to chase quicker passes as we race around Australia in the upcoming 2018/2019 400 Thunder season. We’ll be back with our “Nitro Voodoo” Top Fuel Motorcycle and do it all again, and try and win a sixth title. Matheson dominated the Top Bike category winning three of the five contested rounds, finishing the season on 532 points, with a massive 302-point buffer over his nearest competitor. Thanks to all our fantastic sponsors and fans for your support and kind wishes over the year. See you again next season.